This article is the second in a four-part series exploring how Scientific People Analytics (SPA) can be used to support human capital decisions made by organisational managers. In order to understand how SPA can be used to guide and support management decision-making, it is necessary to look at why and how managers make human capital decisions. This is what we’ll be exploring in this second article. 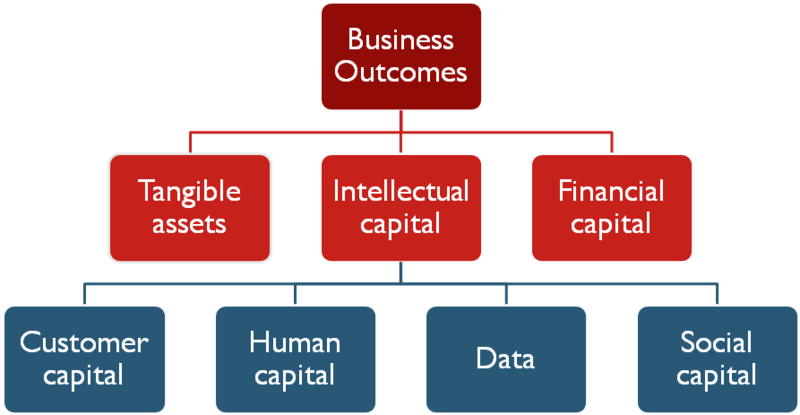 Senior general managers decide how to allocate funds between the competing assets and capitals (resources) required to achieve the desired business outcomes (See Fig 1). For example, a company’s executive team with £100m available may decide to allocate £40m to its human capital investments. Operational managers – with guidance from support functions like HR, marketing and finance – must decide how to deploy these investments in order to achieve desired business outcomes. When it comes to human capital, for example, managers must decide how to deploy people processes such as career development, performance management, succession planning, recruitment and so on. In the past, most allocation and deployment decisions were based on the instincts and ‘gut feel’ of managers. While these factors are important, unconscious biases often result in poor managerial decisions. Today, quantitative methods – known collectively as business analytics – are available to managers to supplement (rather than replace) subjective decision making, leading to higher quality decisions. In the rest of this article, we will focus on the nature of decisions that managers make about human capital and their effect of business outcomes. 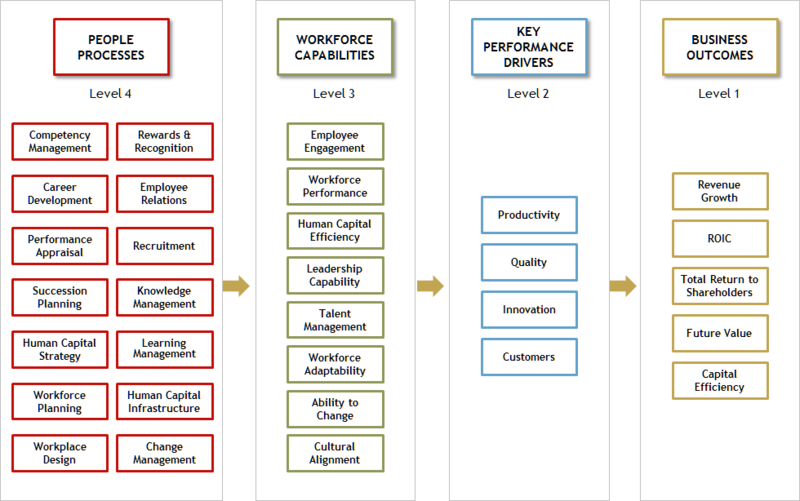 From a human capital perspective, making the right people process decisions delivers the workforce capabilities that an organisation needs to enable its Key Performance Drivers (KPDs), which drive the organisation’s desired Business Outcomes (see Fig 2). The objective of any people analytics project should be to address a problematic business outcome or KPD. Conversely, if managers make poor people process decisions, the organisation will not have the workforce capabilities and KPDs that it needs to achieve its desired business outcomes. The key point here is that desired business outcomes depend strongly on the quality of decisions that managers make about people processes. What knowledge, skills and abilities should we look for in candidates? What channel(s) should we use to attract candidates? How do we integrate new employees into the organisation? The quality of recruitment decisions will affect many of the workforce capabilities (see Figure 3) such as employee engagement and retention, workforce performance, talent management, and workforce adaptability to name just a few. If the people process decisions are successful, then these workforce capabilities will enable the KPDs and desired business outcomes. If not, the company will not achieve any of these. What are our short and long-term headcount and competency requirements for executing our strategy? Which regions will have roles that are most difficult to fill? Which roles could be more productively performed by technology automation? Again, the quality of these decisions will affect many of the workforce capabilities shown, which will have knock-on effects to the KPDs and desired business outcomes shown in Figure 3. Given that successful people process decisions are so important for achieving desired business outcomes, how do managers know which people processes to target first? Or how do managers prioritise repairs to problematic people processes that are limiting organisational value? The answer lies in a people analytics technique called value profiling. Value profiling identifies those people processes that are most important for achieving desired business outcomes in your organisation, but are least effectively implemented. This information is usually presented as a policy matrix such the one shown in Figure 4. 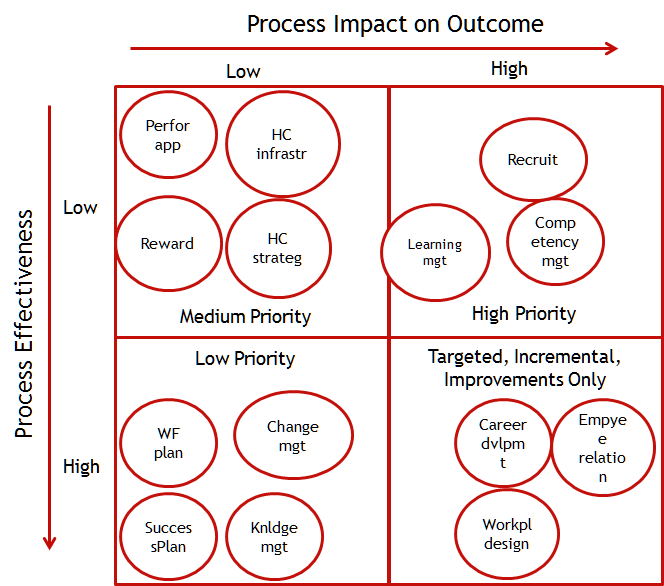 This policy matrix suggests that at this particular organisation, recruitment is the most important people process for achieving desired business outcomes; unfortunately, however, it is also the least effectively implemented. Therefore the most important action this company could take to improve human capital contribution to business outcomes would be to improve the effectiveness of its recruitment process. The second most important action it could take, based on Figure 4, would be to improve its Competency management and then its learning management processes. Policy matrixes like this one are generated by using a structured questionnaire to ask senior managers, selected HR personnel, and a cross-section of operational and functional employees to rate (1) the importance and (2) the effectiveness of each of its people processes. These results are then collated and correlated to produce the policy matrix. It is perhaps worth emphasising two takeaways from the above analysis. This point is worth mentioning because the end goal of so many people analytics projects today is addressing problematic workforce capabilities such as retention or leadership issues. Is ‘luck’ the best that organisations can hope for when repairing people processes in order to achieve their desired business outcomes? While these may appear to be be important, they are not always sufficient to justify the existence of people analytics investments and projects. This is because people analytics exists not to fix workforce capability issues; it exists to enable the company’s KPDs in order to deliver its desired business outcomes. The message here is that the objective of any people analytics project should be to address a problematic business outcome or KPD. Value profiling will ensure that this is achieved. While managers can make decisions about people processes, they cannot make any direct decisions about workforce capabilities, KPDs or business outcomes. For example, they cannot decide that ‘retention’ or leadership will improve by 30% tomorrow; but they can decide to improve relevant processes tomorrow, such as career development and compensation. With any luck, these process changes will result in higher retention and whatever business outcomes they were seeking. But is ‘luck’ the best that organisations can hope for when repairing people processes in order to achieve their desired business outcomes? No... the good news is that they can rely on more than luck. They can learn to use the Scientific People Analytics process described in Part 3 of this series coming up next.